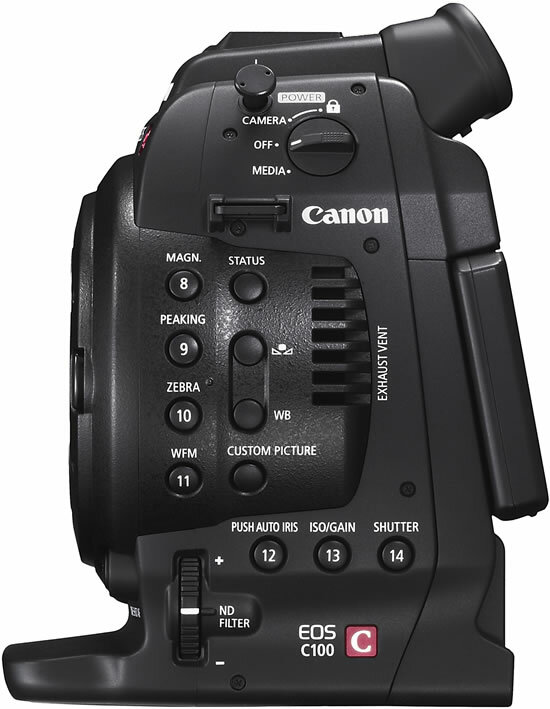 Designed for professional operability, the Canon EOS C100 digital video camera includes a push auto iris function, one-shot auto focus (or full manual focus and exposure control), a multi-angle 3.5-inch LCD control panel, a high-resolution electronic viewfinder (EVF), built-in ND filters, dual XLR inputs, and a locking HDMI output. These features combine with such advanced technologies as reduced rolling shutter artifacts in 60i mode, enhanced gamma modes (including Wide Dynamic Range (DR) Gamma and Canon Log Gamma), cinematic depth of field characteristics, and excellent low-light performance. 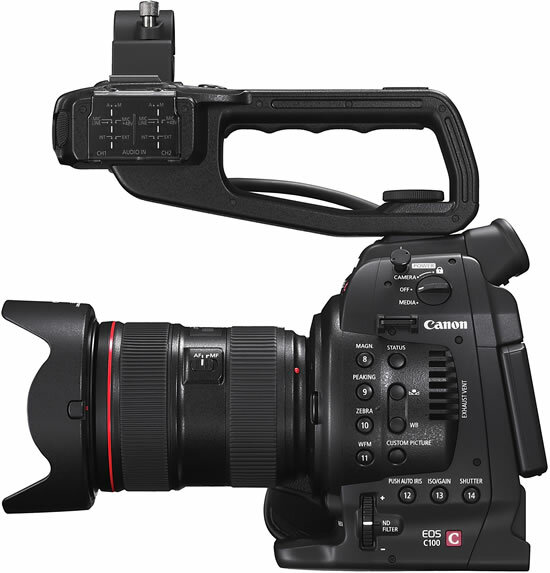 The C100 records to dual SD cards contributing to the camera’s reduced size and convenience. 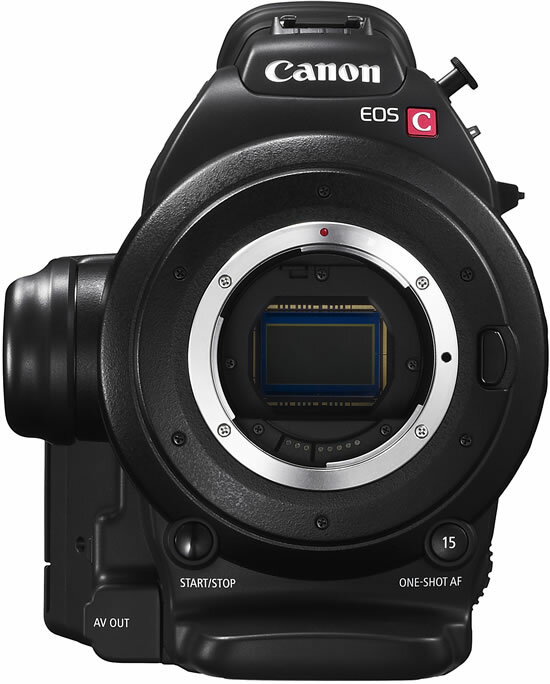 Like its C300 sibling, the EOS C100 employs Canon’s uniquely designed Super 35mm 16:9 CMOS sensor that captures individual R, G, and B channels for each full HD 1920 x 1080 frame. The Canon DIGIC DV III image processor in the C100 helps ensure high color fidelity and smooth color gradations. The camera’s AVCHD codec utilizes MPEG-4 AVC/H.264 compression similar to the codec used in Canon’s XA10 professional HD camcorder. AVCHD features a maximum recording bit rate of 24Mbps in full HD 1920 x 1080 and 4:2:0 color space for sharp, vivid images. In addition to its ability to record to both SD cards simultaneously, or relay-record from one card to the other, the Canon C100 Cinema EOS camera can also output uncompressed digital HD to an external recording device via its locking HDMI connector. This HDMI output includes superimposed time code and 2:3 pull-down marker information. Additional outputs include a USB connector and stereo headphone jack. The Canon EOS C100 Digital Video Camera is scheduled to be available in November 2012 for an estimated list price of $7,999.